ANAHEIM, Calif. — Jakob Silfverberg and the Anaheim Ducks long saw their playoff hopes evaporate, but that hasn't stopped them from trying to end the season with some momentum. 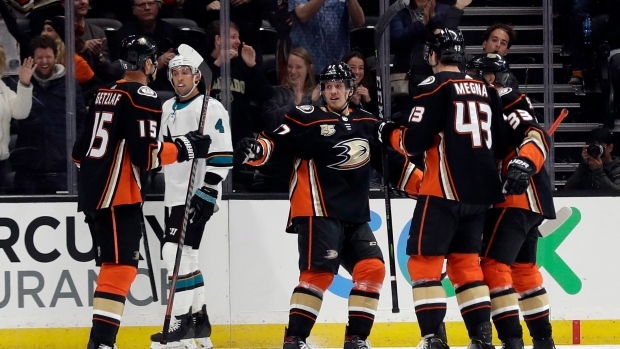 Silfverberg's goal 38 seconds into overtime propelled the Ducks to a 4-3 victory over the San Jose Sharks on Friday night for their seventh win in the last 11 games. He had a goal and two assists for his fifth multi-point game of the season, and second against the Sharks. The game-winning goal was a snap shot from the slot that beat San Jose's Aaron Dell on his stick side. It is Anaheim's first OT win since defeating Columbus 2-1 on the road on Dec. 15. "Ricky (Rickard Rakell) made a great play at the line. I was just crossing behind him, and he had them looking at him," said Silfverberg, who has 23 goals this season. "I got my skates moving toward the net. Figured I might as well try. I put a lot on it, and it went in." Rakell had his first multi-point game of the season with two goals and an assist. Adam Henrique also scored a goal, while Troy Terry and Cam Fowler each had two assists. John Gibson stopped 23 shots. The Ducks' power play has struggled, but they scored twice with the man advantage for only the sixth time this season. "We're starting to work together more and play a little bit more loose. Our mentality is just to go out there and help each other," Rakell said. San Jose clinched a playoff spot Tuesday, but has dropped five straight. It remains five points behind Calgary for the Pacific Division lead. Kevin Labanc, Timo Meier and Justin Braun scored for the Sharks, and Marc-Edouard Vlasic had two assists. Dell made 16 saves. "I thought that we were a little tighter tonight defensively," coach Peter DeBoer said. "I don't think we gave them very much. The chances they got, they stuck in the net, though." Labanc evened it 2:29 into the second period with a wrist shot from just inside the left faceoff circle that Gibson was unable to get his glove on. The goal was Labanc's 14th, and his 50th point of the season. The teams then traded power-play goals in the third. Anaheim took a 2-1 lead at 2:41 when Henrique took Troy Terry's pass and tipped it through the legs of Dell for his 18th and second in the past three games. Meier gave San Jose only its second power-play goal in the past seven games when at 6:29 when he tipped in Joe Thornton's wrist shot that slid by Gibson. It was Meier's 28th of the season and second in the past four games. Burns extended his point streak to four straight games with an assist. Sharks defenceman Justin Braun, who appeared in his 600th NHL game, sent it to overtime on a wrist shot after the puck caromed off the boards with 2:40 remaining for his second. NOTES: The teams split their four regular-season meetings. ... Anaheim reached overtime 13 times in its first 24 home games, but this was the first time since Jan. 9 against Ottawa it had been tied after regulation at the Honda Center. The Ducks are 6-6-2 in OT home games. ... San Jose is 4-3-1 in overtime road games. ... Anaheim C Ryan Getzlaf had an assist on Rakell's goal, and has six points (one goal, five assists) in the past four games.